It’s always fun to try something new, but in this case the something new was a sci fi galaxy map, and the client was Overbrook Entertainment, and Will Smith. The brief was to create 4 maps for the expanded universe around the movie After Earth. There are a bunch of books and graphic novels associated with the film. Those stories had been written in parallel with the movie development and each had added something to the geography of the universe. 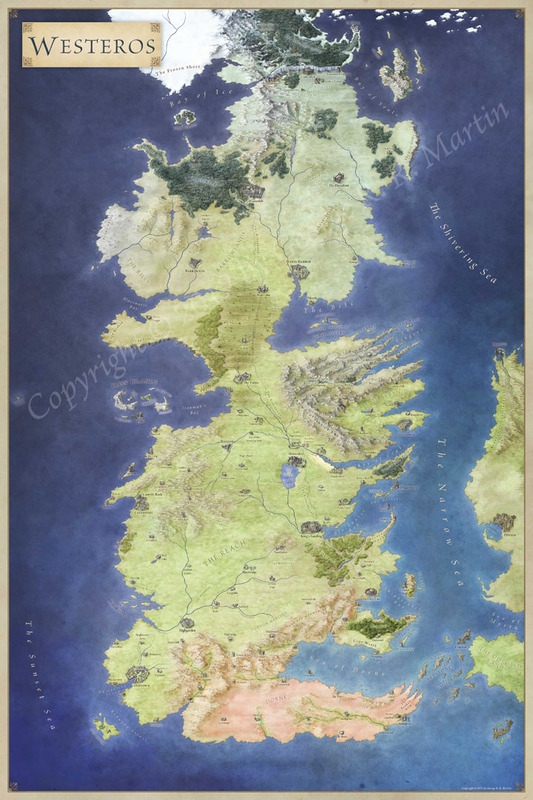 One of the writers on the expanded universe material was an old RPG hand, and noticed that what the worldbuilding needed was reference maps – of the universe, solar system, world, and key city. And so I got a call. I’ve written up a couple of tutorials before on drawing isometric mountain ranges for fantasy maps – but never more than the pen and ink stage. I’ve had a few requests for how to take this to the next step and colour the mountain ranges. Note that I use a graphics tablet. You can do this with a mouse and low opacity brushes, but tablets are getting good and relatively cheap. I’d recommend picking up something like the Bamboo Splash if you’re going to be playing around with illustrating maps. 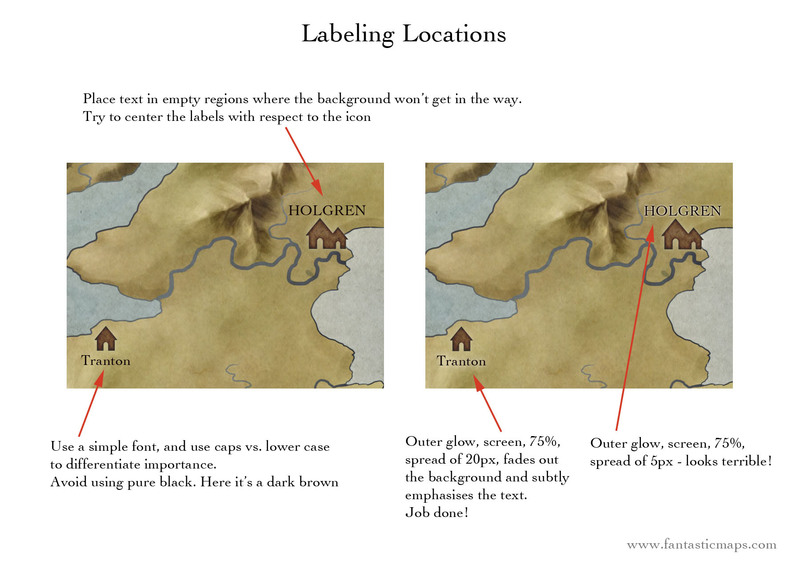 Eric Quigley asked about labeling recently and that prompted me to think a little about how I actually go about labeling a map. Often it’s the last thing to get done, but it’s also the most important. A map without labels is just a pretty picture, it’s not useful. So, it’s worth taking some care getting labels right. This is a photoshop tutorial, but these techniques are almost identical in Gimp. This tip is a quick one. Isometric maps are fun, and can have a large impact. The side on view gives the option for more detail and a more illustrative style. Rivers can break or make an isometric map. On a top down map, a rivers travel in all directions. On an isometric map they should travel further left to right, than up and down. If a river travels straight up and down on an isometric map it’ll look out of place. In the map above I’ve pulled the curves of the rivers further out when they travel left and right. This helps sell the idea that you’re looking down on the map from an angle. This, combined with the same trick on the coasts, can sell the perspective and foreshortening that the isometric map requires. How to Draw Icons – and a Free Ship! At the start of the month I released the Iconic Island – a map pack with an island map and a load of individual map icons indicating things like castles, cities and ruins. Today I’m covering how to create your own icons. This is a slightly longer tutorial than normal and will cover some new Photoshop techniques, specifically using the pen tool, and more on layer blend modes. There’s also a video at the end of the tutorial to help illustrate the steps in more detail. 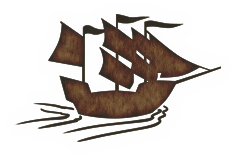 Author JonPosted on February 9, 2013 Categories Map, Tips and TricksTags Battlemap, free icon, icon, layer styles, path tool, photoshop, pirate, ship, shipwreck, square rigged, tutorialLeave a comment on How to Draw Icons – and a Free Ship! Today, a quick tour of one of the hidden gems of Photoshop – especially for building and structure mapping: The Grid.